VOLUNTEERS from the Children’s Hospice in North Belfast were recognised at a recent event to celebrate their contribution and effort. The ‘Volunteer Thank You’ event paid tribute to all the volunteers at the Hospice, including Jordanstown woman Mary Devlin who has been volunteering in the kitchen for five years. 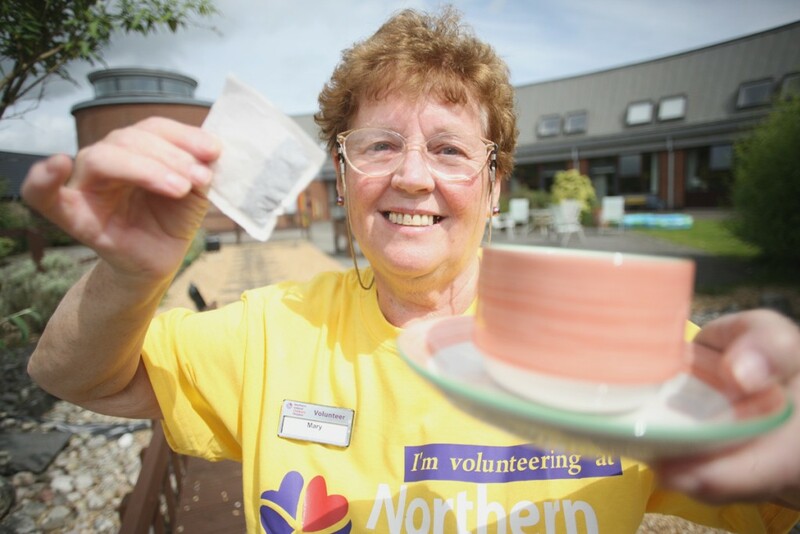 Mary, who was previously a nurse for 45 years, volunteers every Wednesday from 10am to 1pm at the Newtownabbey site and said volunteering has given her a lot of satisfaction. “I got involved in the Children’s Hospice as a volunteer when I saw an advertisement in the paper and I felt it was a place I would like to be in,” she explained. “I also got involved because I had a son who was quite severely disabled, but unfortunately passed away. I felt I had to do something to help others. “I was a nurse for 45 years but volunteering in the Hospice has given me more satisfaction than the whole time I was a nurse. Volunteering is extremely important. It doesn’t have to be much of your time. I do four hours a week but I would encourage people to think about giving up some of their time. I get so much satisfaction out of my volunteering, especially when the parents are happy seeing their children settle in. “It gives them time to have a bit of family time with their children that they wouldn’t get at home because they are too busy looking after and caring for them. The North Belfast volunteer also paid tribute to the ethos of the Children’s Hospice and said she feels honoured to be part of the family. “People think of it as a Hospice and end of life and are frightened of it,” she said. “Many parents tell us when Hospice is first mentioned to them they feel scared and that it is not the right place for their child. However, once they have visited the Hospice and met with staff, many realise it is not what they had expected. “We work hard to put a strong focus on the family spending quality time together. We also have good times here and it’s a home from home. When you are working in this place and see it as it is, it’s not daunting and doesn’t look like a Hospice. It looks like a home and actually seeing the children here makes you realise what a wonderful enviornment it is. Speaking about being one of the Hospice volunteers who was recognised, Mary said: “It meant a lot to be recognised as a volunteer. All the staff here are phenomenal and you couldn’t work with nicer people in the kitchen. Nothing is too much trouble for the staff here and they are always very accommodating. “The staff make me feel like I am part of the whole Hospice family and the volunteer’s role saves plenty of money which can go towards things that we really need. Rewarding volunteering opportunities are available in the Children’s Hospice, in the community and in charity shops. Go online at www.nihospice.org and go to ‘Support Us’.